This memorable climb ascends the most striking corner at Five Open Books.Whil there are no single moves as technical as Commitment, the route is more sustained and much harder to protect. 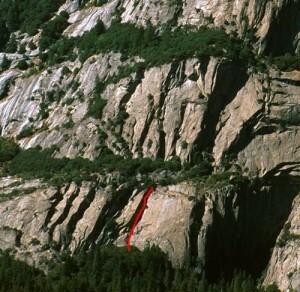 The route is mostly a 5- to 7-inch crack in a huge corner that is usually liebacked (there is only a brief section of chimney). Unless you are comfortable with 10- to 20-foot runouts, bring a few pieces in the 5-7" range. Even with big cams, it?s not possible to pull through many of the cruxes on gear. The second pitch is the endurance crux and requires sustained 5.7 to 5.8 liebacking. Which SuperTopo guidebooks include a topo for Hanging Teeth?